Whether your characterizing PTMs, monitoring the degree of protein contamination from host cells used to produce therapeutic antibodies, or quantifying differences across biological conditions, the microDIA-Protalizer workflow can expand your laboratories capabilities beyond current state-of-the-art DDA strategies. 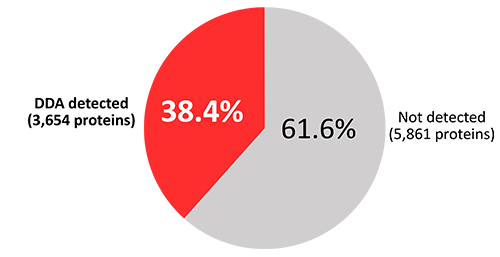 microDIA-Protalizer increases protein sensitivity 70% compared to a DDA-X! Tandem workflow. Visit our homepage to download the micro-DIA Impact II demo dataset shown. Our design for microDIA acquisition reduces the noisy MS2 data generated with traditional SWATH and other DIA approaches that apply very large precursor isolation windows. ​microDIA acquisition example on Bruker Impact II QTOF. Schematic of the acquisition procedure optimized for sensitivity that uses A 37 Hertz MS2 scan rate. 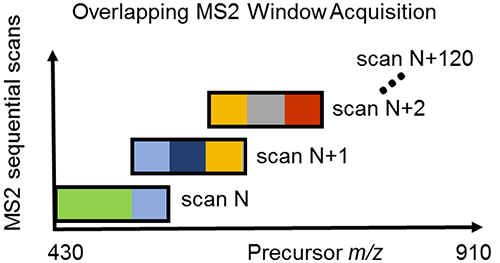 MS2 windows are 6 m/z-wide and increased by 4 m/z per scan. Deconvolution schematic. Because the overlapping nature of microDIA isolation windows are known by Protalizer, MS2 spectra can be parsed into reconstructed MS2 spectra where the precursor-fragment lineage is 3-fold more specific than the initial scan data as shown below. ​Protalizer includes an advanced search engine, Protein Farmer, designed specifically for small-isolation window microDIA data. ​Protein Farmer lacks limitations built into current search engines that were initially designed for DDA that are not optimal for DIA. Namely, Protein Farmer queries all the peptides and modifications that may match a given MS2 spectrum by relying on the fragment ions present rather than assuming the precursor value is in the center of an isolation window (e.g., PAcIFIC-Sequest analysis), or attempting to search only MS2 scans that have precursors detectable in noisier MS1 scans (e.g., SWATH-DIA-Umpire). 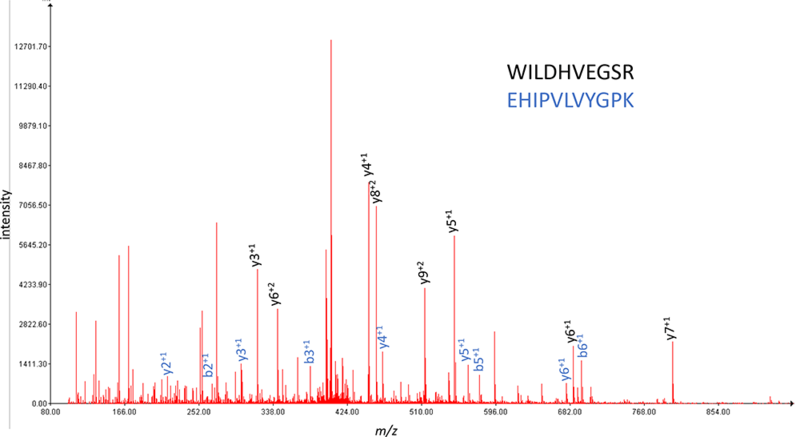 ​​Protein Farmer also has the ability to detect two peptides in an MS2 scan if they have substantially different elution peak shapes – see spectrum below for an example. ​b/y fragment ions are selected for each peptide in a +1 and +2 charge state that have m/z values greater than 300 and in the 10th intensity percentile or greater relative to the strongest b/y fragment ion. MS2 chromatogram area-under-the-curve (AUC) values are extracted for the selected fragment ions and used for determining the fold-change across samples. Only MS2 chromatograms that have fragment ions with similar peak shapes for each peptide are retained with a minimum signal-to-noise ratio of 1.5. 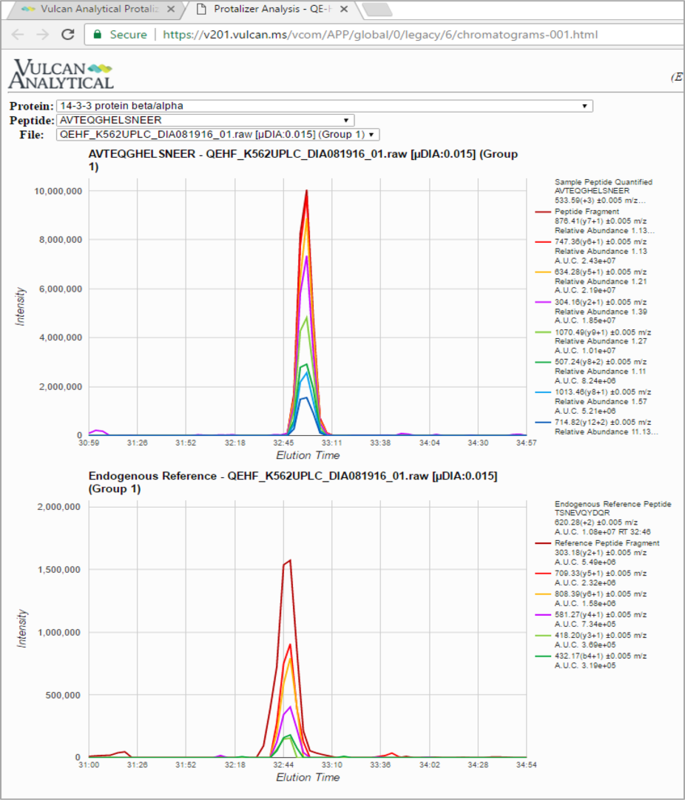 Then Protalizer normalizes label-free data by selecting endogenous reference peptides with the least amount of intensity variation across samples in a dataset. A customized set of endogenous reference peptides are matched to every peptide quantified with similar retention time and the relative abundance of each peptide is calculated by dividing the MS2 AUC intensity of each peptide by the endogenous reference peptides. ​To avoid missing quantitative data for peptides not consistently detected by Protein Farmer in every sample, Protalizer determines normalized retention time for peptides by the retention time offset from endogenous reference peptides with similar elution time. Then the normalized retention time coordinates along with optimized fragment ions are extracted as MS2 chromatograms. 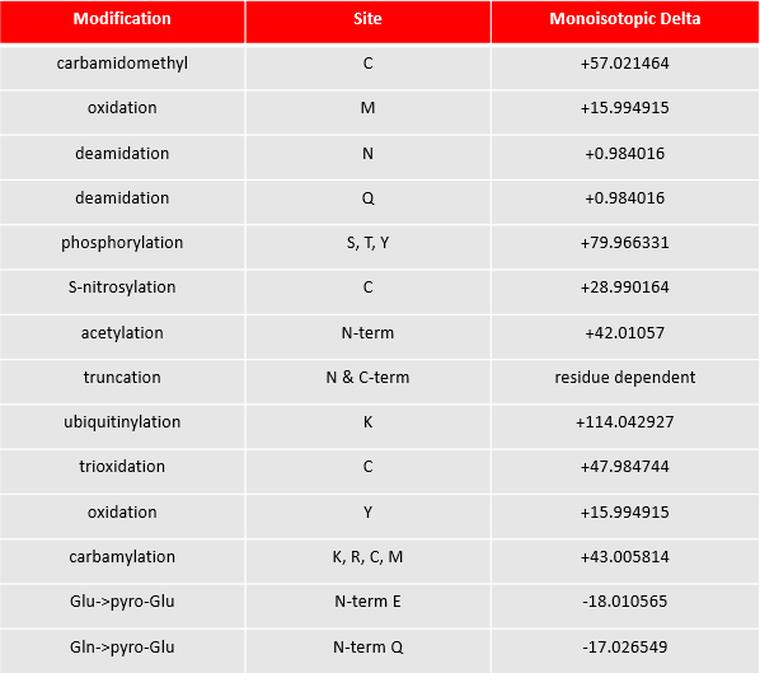 Protein relative abundance across different biological conditions are preferentially quantified by peptides specific to the assigned protein that were detected in each sample compared. 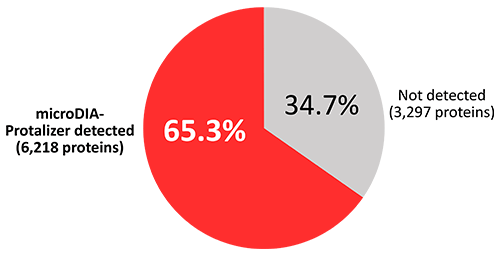 Statistical significance of protein differences can be determined with the software for comparisons with up to 10 different biological conditions. ​A major advantage of microDIA compared to DDA is the ability to verify that fragment ions are likely derived from the same precursor analyte based on having similar peak shapes (co-elution, similar lift-off and touchdown times, etc.). Protalizer generates an alphabetical index of proteins detected in an experiment along with all the assigned peptides. 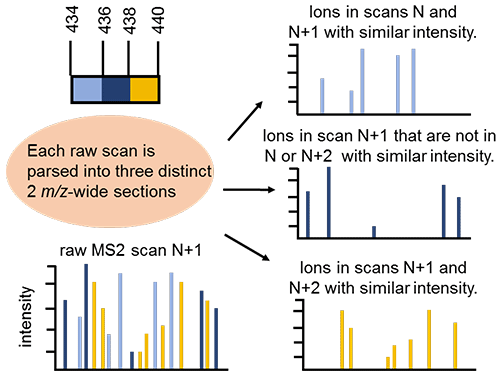 Point-and-click review of identification and quantification results. Data shown are from K562 tryptic digests analyzed by microDIA on a Thermo Q-Exactive HF with a 90 minute gradient. "The high sensitivity proteomics work and the data analysis of the proteomics results by Vulcan Analytical's software and experts were extremely useful for dual R&D programs nearing lead drug clinical candidate selection. Our company, DiscoveryBioMed, Inc., now has a clear idea about mechanism of action of the lead drug in both programs and the data are consistent with past internal work using kinase and other dot blot arrays. Also and equally important, the data are consistent with the literature regarding possible MoA." -- Erik Schwiebert, PhD, CEO Discovery BioMed, Inc.